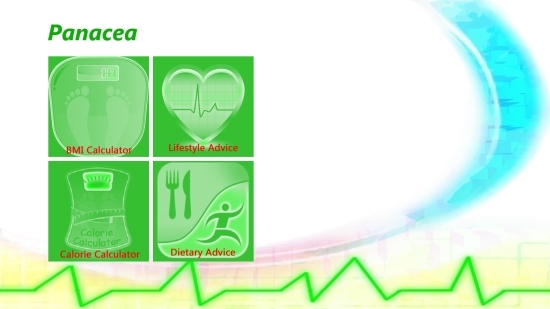 Panacea is a free Windows 8 health app that provides you with accurate BMI and Calorie Calculators. Using this free Windows 8 health app, you can calculate BMI and know if you are underweight, normal, or overweight. Continuing in the thread, Calorie Calculator of the app lets you calculate the number of calories required to maintain this weight. The app also calculates for you the number of calories you can burn by doing different types of activities such as walking, swimming, dancing, gardening, and many more. So, you can see which activity is most suitable to help you achieve your target weight. Additionally, you also get useful dietary and lifestyle advice for absolutely free! The application is very expressive as it explains BMI range and calorie requirements for different types of activities as well. The app is freely available in Health & Fitness category of Windows Store. You can also view the app directly in Windows Store by clicking on the link given below at the end. Let’s see how this free Windows 8 health app works. 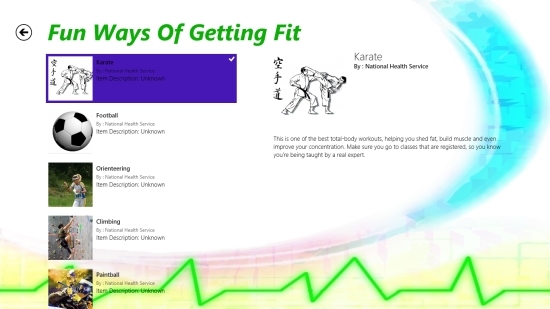 To use this free Windows 8 health app is extremely easy. It supports both measurement units for calculation – kg and lb. As you land on the app’s main page, you will see the Start screen of the app displaying four sections – BMI Calculator, Calorie Calculator, Lifestyle Advice, and Dietary Advice. To calculate your BMI, click on BMI Calculator option. Choose the desired unit and enter your weight and height. Your BMI will instantly be displayed on the screen along with status – underweight, normal, or overweight. 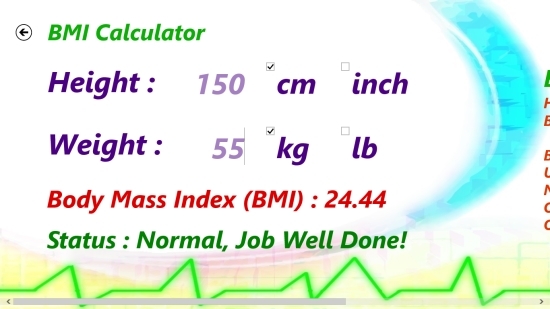 You will also find BMI Help section on the screen that will display the formula to calculate BMI and weight range for BMI status. Similarly for Calorie Calculator, select the desired unit and enter your weight, gender and activity level. You can choose your activity level using the dropdown provided in the app. 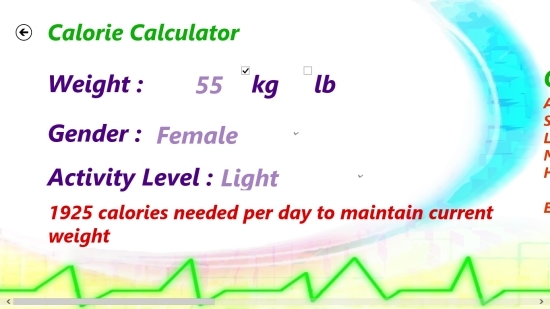 The calories required to maintain the given weight will be instantly calculated and displayed. The app also explains various types of activity levels and calculates how much calories you can burn by doing different types of activities. A number of activities are listed in the dropdown for the purpose. The other two sections of the app offer valuable lifestyle and diet advice. To access this, click on the desired tile on the Start screen. The next screen will display the related content in the form of picture tiles. Click on any tile to open it. It will display a list of useful advices. You can click on them to read the information they carry. Use the back arrow button on top left to go back to the main screen. You might also try EatSmart, Nutrition Manager, and CaloriesCalculator. Panacea is a very well designed app for calculating your BMI & Calorie requirements. You also get useful advice on diet and lifestyle. I shall say the app is a perfect package to help you keep up a healthy living. Give it a try and share your feedback via comments.